When I went to Chicago last month, I spent over 16 hours (with power) on the train. I could only work on my paper submission for so long, so I spent some time organizing my pictures and pulling out favorites. Here are six pictures from my travels, proving that I travel to places other than Europe. I never tire of this image from Florence, Italy. I’ve posted it before, but I think it’s my favorite travel picture to date. Great memories of lots of gelato with Rachel and some amusing incidents with my Italian. Namely that in trying to buy bus tickets I ended up buying two parking spots for one hour at the train station in Lugano, Switzerland. In 2004, I studied in England and got 4 weeks off over Easter to review for exams and travel. My roommate was also studying abroad in France so I went to visit her in Grenoble and then we flew up to London to tour the UK for a week. 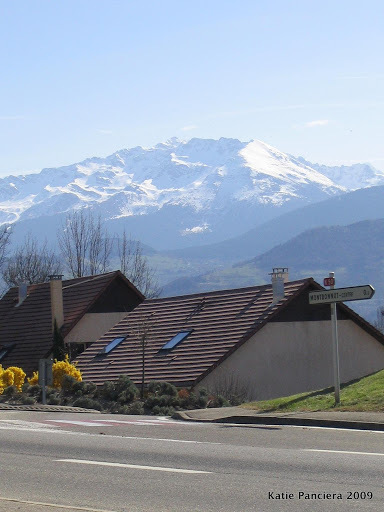 This was taken by her bus stop on the way to the University of Grenoble. I love the alps! May Day (Ascension Day) at St. John’s College Cambridge. The choir was supposed to sing from the tower, but the rain and hail made that unsafe, so they sang from the yard. All the children from the school were all around the courtyard with parents and tourists. Quite a festive occasion, made more so with the great white and red robes. This is from a class trip to Mexico in 2003. We were studying the role of women in the Zapatista community and traveled to Oaxaca and Chiapas. 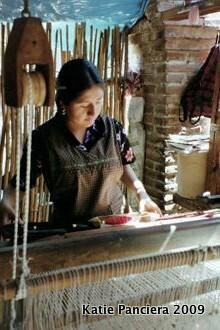 This lady was part of a women’s weaving cooperative about an hour from Oaxaca city. The coop was called Las Mujeres De Vida Nueva. Sometimes I even travel when injured. This was my current state when Mom was visiting California this past summer. 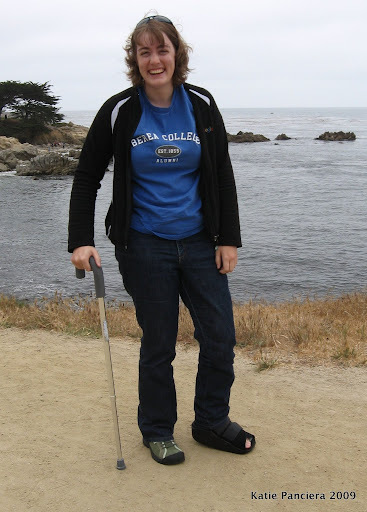 My equipment that week ranged from crutches and aircast to cam walker boot and cane. We couldn’t miss the opportunity to visit Monterey and take cheesy injured Katie pictures. I imagined an article about how bacon is in, as it once was. I was a little confused as to the tie between bacon and Vaudeville. Then I read it again. A theatre is restored. Way less confusing and funny.